After a loss, the biggest comfort other can give the bereaved is the knowledge that others are thinking of them and understand their sense of grief. In many cultures, it is customary to convey this sentiment by sending a floral arrangement and a card expressing condolences. Funerals are one of the few occasions where the bouquet is "for" one person (the deceased) but should be tailored to the needs and expectations of other people (the family). With that in mind, here are some questions to consider when choosing your flowers. 1. What is the family's belief system? The Christian, Catholic, Mormon, Buddhist and Baha'i traditions welcome flowers. However, you will want to ask the family if they would prefer the arrangement sent to the church, a funeral home, or to their home. Christian and Catholic funeral flowers tend to be white (if sent to the church). If you are sending the flowers to the family's home, muted shades of blue or purple may also be acceptable. Note that flowers arranged in the shape of a crucifix or a cross are not acceptable at funerals outside the Christian and Catholic traditions, including at Mormon funerals. Flowers are not expected at Hindu memorial services, but may be welcomed by Hindu families who recognize the sentiment behind the gift. The Muslim tradition varies by family; some Muslims would not welcome the extra adornment at a solemn occasion. Check with the family, the family's imam, or the family's mosque before sending a bouquet if you are unsure of their beliefs. It is important to note that Jewish tradition does not embrace flowers at a funeral, especially among the Orthodox Jewish community. 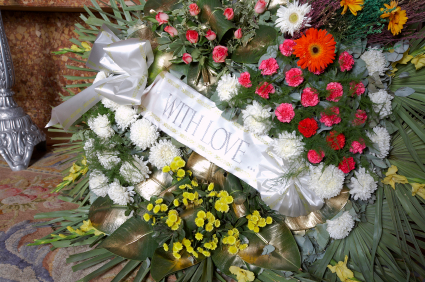 Some less strict sects may place flower arrangements in the synagogue or send flowers to the home of the bereaved, but you should not do so without checking with the family. The traditional bereavement tradition is to bring food for the family while they sits Shiva, a one week period of mourning spent in the home. If the family does accept flowers, bring a simple bouquet in white, blue, or relatively sedate colors along with your food when you visit for your Shiva call. 2. Bouquet or Arrangement in a Vase? Before sending flowers anywhere besides the home of the family, check with the funeral home or religious establishment to see if they have limitations on flowers. Some establishments allow only professional florist deliveries, only arrangements using florist foam (as opposed to open vases), or ban bouquets. A formal floral arrangement, stored in an included vase, pot or basket, is best if you are sending flowers to the family's home or to the funeral ceremony itself. During the period of mourning, the family may receive many bouquets. Consequently, they may run out of vases. The religious establishment itself may have a few vases on hand, but they will not be able to accommodate high volumes of bouquets. A bouquet is also less formal, and a funeral is a solemn occasion. This rule does not necessarily apply if you are sending flowers to a funeral home. Be sure to call and inquire about the funeral home's rules before purchasing a bouquet or arrangement, though. While a full floral arrangement is more traditional and formal, the funeral home will probably be prepared to accommodate bouquets. When sending flowers after a loss, it is proper to include a card. Do not go overboard. If you did not know the person or the family well, offer your condolences for the family's loss and sign your name. If you knew the person well, add a brief note expressing two or three character traits that made the person wonderful. "X was a vibrant, cheerful person who always knew exactly how to brighten your day." If you are unsure of the family's views on religion, try to keep religious sentiments out of your card.